The absorption of atmospheric CO2 by the oceans results in a decline in ocean pH, hence ‘ocean acidification’, and reduces the availability of carbonate. This presents a problem to calcifying organisms (those that deposit calcium as either calcite or aragonite as hard parts) because they cannot produce their shells, valves (in the case of bivalves), or tests (in the case of diatoms) as readily. To explain this, we need a little chemistry. When CO2 dissolves, it combines with water to form carbonic acid (H2CO3). 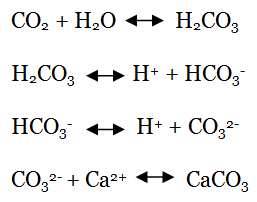 This then breaks down to form bicarbonate (HCO3–) when one hydrogen ion is lost, and then carbonate (CO32-) as the other hydrogen ion is lost. This carbonate is the important stuff, as it combines with calcium to form the calcium carbonate (CaCO3) used by bivalves to produce shells. If something (such as the ocean) is more acidic, there must be more hydrogen ions available. These hydrogen ions interfere with the calcification process as they bond with carbonate, meaning there is less available for shell formation. Calcification: carbonate chemistry in action! This process is relatively well established for a number of calcifying organisms, although there are exceptions to (the coccolith, Emiliania huxleyi, for example) and the response to elevated CO2 levels is not uniform across species. Much of current research has focussed on the effect of constant CO2 levels on calcification, but what about animals that live in environments where the CO2 concentration is constantly changing? The availability of carbonate in estuaries is particularly variable as CO2 concentrations vary seasonally (there’s a greater carbon load in the winter as storms wash nutrients into rivers), diurnally and with the tide. The impact of elevated CO2 levels on an organism is also dependant on its life stage; something that is particularly true of bivalves. 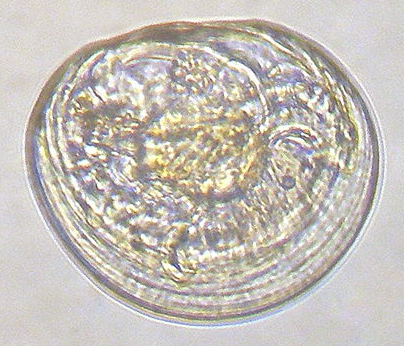 Bivalve larvae. Photo credit: Minami Himemiya (source). Bivalves spend the first part of their life in the plankton, first as a veliger (a relatively amorphous looking ciliated blob) and then as a pediveliger (that same blob, but this time with an identifiable foot) before metamorphosing into a miniature adult. During these larval stages, they are particularly vulnerable to ocean acidification and, until recently, both the reasons behind this, and the longer-term implications of this vulnerability, were unclear. This is where doctors Christopher Gobler and Stephanie Talmage come in. They took to the lab to tackle why larvae are especially vulnerable to acidification and what this means for them in both the short and long term. 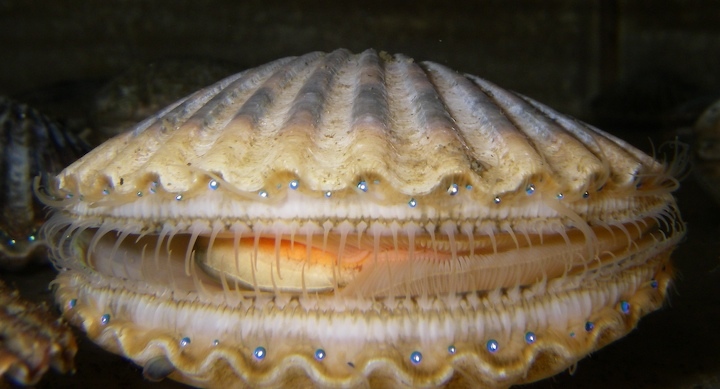 It’s impossible to take a look at how all bivalves respond to acidification, though, so to tackle these questions, two bivalve species, the hard-shelled clam (Mercenaria mercenaria) and the Atlantic bay scallop (Argopecten irradians) joined the team. The Atlantic bay scallop, Argopecten irradians. Photo credit: Rachael Norris and Marina Freudzon (source). Using their RNA:DNA ratio as a proxy for growth and the uptake of a radioactive calcium isotope, 45Ca, to estimate calcification, Gobler and Talmage found that growth in the presence of elevated CO2 results in individuals of a smaller size. This is because there is less calcium available for uptake. Their findings, revealed that high CO2 concentrations, not only affected size, but also negatively impacted bivalve physiology, as individuals reared in these conditions were found to have thinner shells. Shells are an important defence against predators and the reduction in shell thickness (and hence strength) may put them at greater risk from predation. 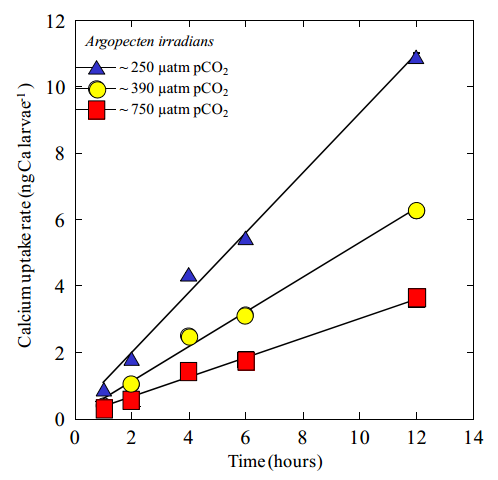 The higher the CO2, the slower the calcium uptake: calcium uptake rates of larval Atlantic bay scallop, Argopecten irradians, under different CO2 concentrations over a 12-hour period (Gobler and Talmage, 2013). When transferred from a high CO2 environment to an environment with an ambient CO2 concentration, larvae grew faster than those in ambient conditions throughout the whole of their development. However, this higher growth rate doesn’t compensate for the low calcification rate during larval stages, as their final is still smaller than individuals reared in ambient conditions at all life stages. This “legacy effect” presents a significant problem for adult bivalves, due to the detrimental impact of reduced calcification on their defences. Gobler, C. J. and Talmage, S. C.: Short- and long-term consequences of larval stage exposure to constantly and ephemerally elevated carbon dioxide for marine bivalve populations, Biogeosciences, 10, 2241-2253, doi:10.5194/bg-10-2241-2013, 2013.